Wingwalking. If you’re not sure what it is, it’s exactly what it sounds like. 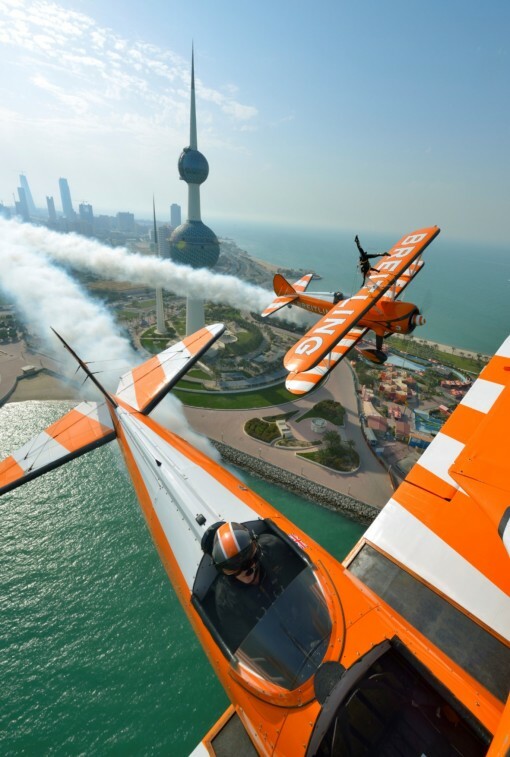 While strapped to the top wings of Boeing Stearman biplanes, wingwalkers perform a breathtaking sequence of acrobatic maneuvers and handstands as the aircraft flies through a routine of dazzling aerobatics and close formation flypasts. These maneuvers include loops, rolls, stall turns, and inverted flight. As for how the wingwalkers handle this at speeds of up to 150 miles-per-hour, Sprangled caught up with professional wingwalker, Sarah Tanner of the UK-based Breitling Wingwalkers, to learn all about what it’s like to willingly perform sky-high tricks on the outside of a soaring plane. The team in Japan. Photo by Katsuhiko Tokunaga. Where did the art of wingwalking originate? The American Ormer Locklear was one of the pioneers of wingwalking. He first left the cockpit during flight to fix a technical problem, and in 1919 he formed the ‘Locklear Flying Circus’ and traveled America performing his wingwalking act at airshows. 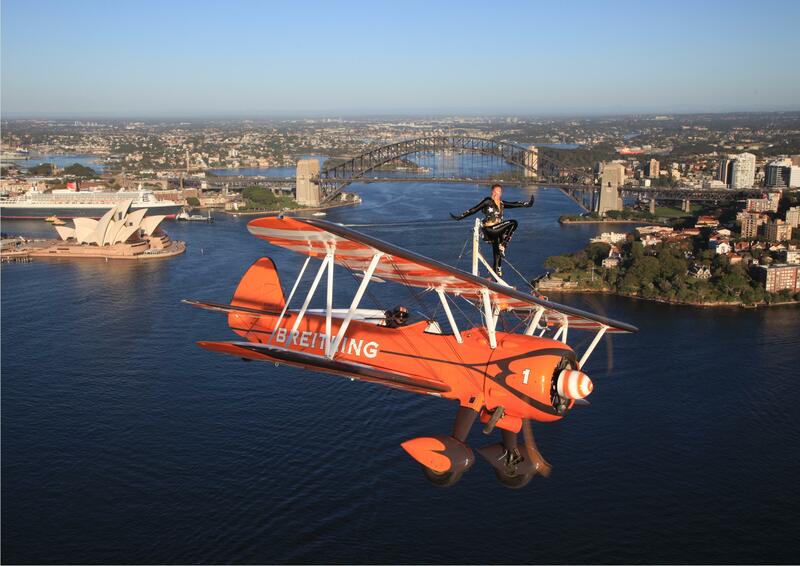 Since then wingwalking displays have become a unique airshow act harking back to the glamourous 1920s era. Wingwalking was slightly different in those days though — for a start they did not use safety harnesses! What was it that interested you in becoming a wingwalker and how long have you been performing? I love dancing and flying and I think wingwalking is a perfect match. As a child I watched the wingwalking team in awe at airshows, but never thought I would get the chance to wingwalk for real. Years later I was working at an event where the team was displaying and my boss at the time spurred me on to contact them saying I should go for it as I was the right height and weight. Wingwalkers need to be fairly small to create the least amount of drag on the wing in order for the aircraft to perform the airshow display manoeuvres. That was back in 2006. Tanner flying in Australia. Photo by Michael Jorgenson. What kind of training is involved in order to become a wingwalker? There is a lot of training involved to become a professional wingwalker. Lots of sessions in the gym to build the necessary strength to perform against 120-mph winds and lots of training indoors in the hangar before the aircraft is even pushed outside. Learning how to operate the safety harnesses, climbing up to and down from the cockpit to the wingwalking rig on the top wing as well as learning the wingwalking performance manoeuvres such as handstands. After a week of training in the hangar, the trainee wingwalkers take to the skies and starts many weeks of training on the wing in flight. Where, and how often, do wingwalkers perform? 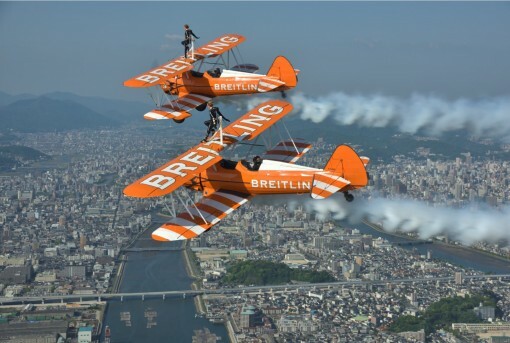 The Breitling Wingwalkers perform all over the World. In recent years we have displayed at events throughout Europe and the UK, and also in India, Japan, China, Australia, Dubai, and Kuwait. The European display season runs from May until the end of September and during the winter months we head further afield for the warmer weather. Have you encountered any dangerous experiences up in the sky? Wingwalkers are highly trained and are always secured to the aircraft by a safety harness. The pilots flying the aircraft are very experienced and our display is a highly rehearsed routine. For every flight we also take in to account the weather conditions. The thing wingwalkers are actually scared of is the rain, as flying through the rain at 120 mph — the raindrops feel like pins! The team flying in Kuwait. Photo by Katsuhiko Tokunaga. What kind(s) of planes are used, and how high do they fly when wingwalkers are on board? We use Boeing Stearman Biplanes. For the start of the display the aircraft fly up to 1,000 feet as they need the height to perform the impressive formation loop. If someone would like to become a wingwalker, how would they go about making that dream come true? Every few years we have a vacancy for a new wingwalker to join our display team ‘The Breitling Wingwalkers’, we advertise on our website and social media pages. We do not ask for any previous wingwalking or aviation experience, but an interest in fitness and a background in dance or gymnastics is ideal. For those interested in wingwalking, but not necessarily as a job — it is possible to buy a wingwalking experience by visiting www.aerosuperbatics.com.